[154 pages report]The plant growth regulators market was valued at USD 1.98 billion in 2016 and is projected to grow at a CAGR of 6.8% from 2017, to reach USD 2.93 billion by 2022. The base year considered for the study is 2016, and the forecast period is from 2017 to 2022. Plant growth regulators control or regulate a plant’s growth processes, including the formation of leaves and flowers, elongation of stems, development and ripening of fruits. The global market size of the plant growth regulators market has been segmented on the basis of type, crop type, formulation, function, and region. This report also helps us to understand the structure of the plant growth regulators market by identifying its various segments. 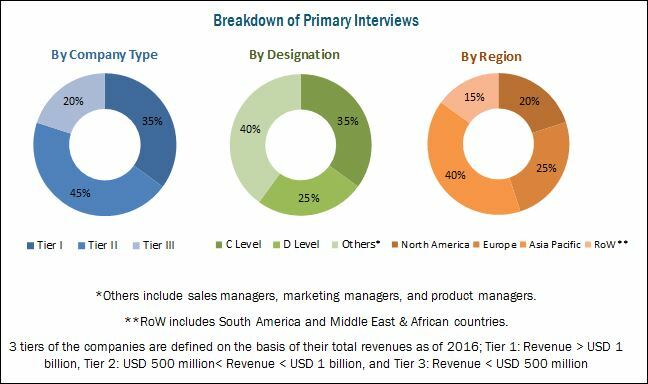 The objectives of the report include analyzing the opportunities in the market for stakeholders, providing the competitive landscape of market trends, and projecting the size of the plant growth regulators market and its submarkets in terms of value and volume. This report includes estimations of the market size in terms of value (USD billion) and volume (KT). Both the top-down and bottom-up approaches have been used to estimate and validate the size of the global plant growth regulators market and to estimate the size of various other dependent submarkets in the overall market. The key players in the market have been identified through secondary research. These include press releases; paid databases such as Factiva and Bloomberg; annual reports; and financial journals. Their market share in respective regions has also been determined through primary and secondary research. All percentage shares, splits, and breakdowns have been determined using secondary sources and were verified through primary sources. The figure below shows the breakdown of profiles of industry experts that participated in primary discussions. The global plant growth regulators market has grown exponentially in the last few years, and this trend is projected to continue. The growing demand for plant growth regulators is projected to fuel the demand for the plant growth regulators industry globally. 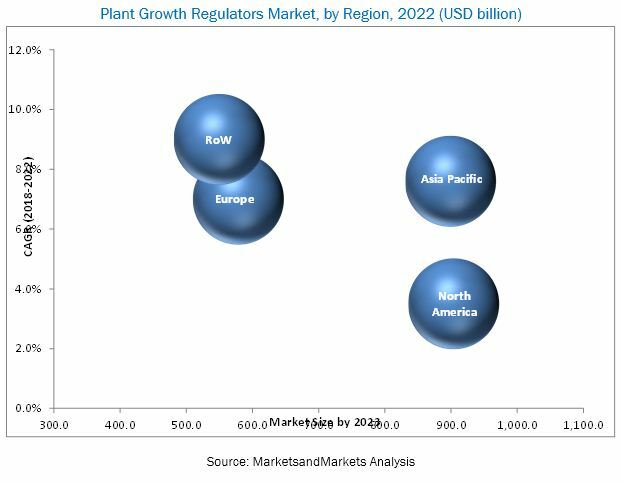 The key participants in the plant growth regulators market include plant growth regulator manufacturers, irrigation system manufacturers and suppliers, end users, and retail channels/supermarkets. With the given market data, MarketsandMarkets offers customizations according to the company-specific needs. The plant growth regulators market is projected to grow at a CAGR of 6.8% from 2017, to reach a value of USD 2.93 billion by 2022. The global demand for plant growth regulators is increasing significantly due to the growing demand for organic food. The market is further driven by factors such as rise in the need for food security for the growing population, advancement in farming practices and technologies, and high opportunities in developing countries. On the basis of type, the plant growth regulators market was led by the cytokinins segment in 2016. Cytokinins provide benefits such as delayed plant aging and prevention of leaf senescence. Cytokinins are applied in a higher concentration during the growth period of mature plants. Cytokinins also find wide usage in the North American and Asia Pacific countries. The plant growth regulators market, on the basis of crop type, is segmented into fruits & vegetables, cereals & grains, oilseed & pulses, and turf & ornamentals. The fruits & vegetables segment accounts for the second largest market share; this can be attributed to the growing health-consciousness among consumers and their rising income levels. In North America and Europe, growing health concerns are driving the demand for fruits and vegetables, as consumers prefer healthier and more nutritious diet options. The plant growth regulators market, based on formulation, is segmented into water-dispersible & water-soluble granules, solutions and wettable powders. The water-dispersible & water-soluble granules segment accounted for the largest market share. Water-dispersible granules provide greater stability and ease of handling during supply chain activities; they are projected to be fastest-growing formulations in the plant growth regulators market in agriculture. The market is segmented, on the basis of function, into plant growth promoters and plant growth inhibitors. Plant growth promoters have a positive or beneficial effect during plant growth stages. The growth of this segment is attributed to the increasing demand for plant growth promoters in various fruits & vegetables to enhance the flowering process for increased yield. The growth inhibitors are used to inhibit plant growth processes such as root & steam elongation, seed germination, and bud opening. Europe and Asia Pacific are the dominant regions in the plant growth regulators market. The major countries contributing significantly toward the growth of the Asia Pacific region include China, Japan, India, and Australia & New Zealand. The increasing demand for organic food is further expected to boost the plant growth regulators market. Stringent regulatory frameworks regarding the maximum residue level in agricultural soil, in the European region, make plant growth regulators a favored product among farmers, as they are more environment friendly. This has made Europe one of the major markets for residue-free plant growth regulators. The major restraining factor for the plant growth regulators market is the long gestation period for new products. The demand for organic products is projected to provide a strong platform for the entry of seaweed-based plant growth regulators. With increasing environmental regulations and residue level monitoring of pesticides, these new ranges of natural plant growth regulators can enhance the market growth. However, the market has been highly dependent on the fruits & vegetables segment. Companies such Syngenta (Switzerland), BASF (Germany), The Dow Chemical Company (US), Bayer CropScience (Germany), Nufarm (Australia), and ADAMA (Israel) together account for more than half of the total share of the plant growth regulators market. These companies have a strong presence in Europe and the Asia Pacific region. They also have manufacturing facilities across these regions and a strong distribution network. They are also focused on innovation and are geographically diversified. These market players are focusing on new product launches with existing and new materials to increase their efficiency. FMC Corporation (US) and Valent BioSciences Corporation (US) are some of the leading market players that adopted this strategy to develop their business.